I really love these earrings! They are a great size, not too big but not too small either. The pricing is very reasonable. I had researched similar earnings and this was very good value. These fantastic dangle earrings are made with cushion-cut green amethysts and round-cut white diamonds set in sterling silver. The beautiful earrings are secured with leverback clasps and shine with a highly polished finish. All carat weights and measurements are approximate and may vary slightly from the listed dimensions. *T.W. (total weight) is approximate. 1/5 carat T.W. may be 0.17 to 0.23 carat. Treatment code N (white diamonds). See Gemstone Treatments for further information. I got these from my hubby for my birthday (I picked them out). I like them. For the price they are nice earrings. 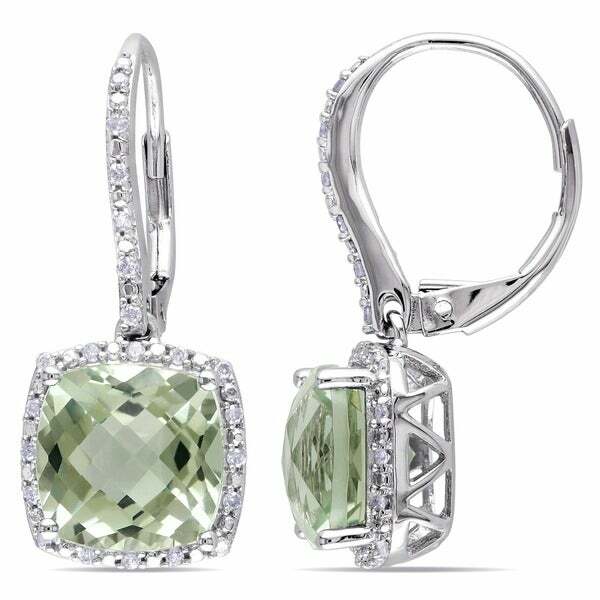 The diamonds don't sparkle as they are low quality, but the green amethyst are very nice. They are also a good size. I wish the little diamonds sparkled but they are still nice. This is great style and color. I received this for my birthday and it's my best so far. I loved it so much I bought this second set for myself! The ring, earrings and necklace are my birthday present :). Great craftsmanship. All three from Miadora and all exactly as pictured. I'm a happy happy 34 yr old! many compliments on these. great quality and great price. Beautiful earrings. Very good quality setting and stones. Earrings were lovely but I was looking for something a little more vibrant to match a ring I have. I returned the earrings. birthday present for my mom. the earrings are beautiful!! Pale green color, very delicate. Looks great with nice sparkle. Beautiful and well made! These were a gift and worked out great! Love these earrings. Rhett could have been slightly bigger but other than that they are absolutely beautiful. My fiance loved them. Great gift. Beautiful. Elegant. Delicate. So happy with these show stoppers ! I love these gorgeous earrungs! They are delicate and elegant. A perfect match for a ring that I naught earlier. The subtle color matches a lot of different clothes. They look great. They're big. My wife loved them. No complaints. "The picture shows the stones being square, equal on all sides; however, the dimensions are listed as 11 by 27. Please clarify. Thank you." Hello Kjon11, I apologize for the confusion, these earring are almost square, the dimensions are approximately 11.4 mm x 12.3 mm. These earrings are approximately 27.2 mm high from the bottom of the earring to the top of the clasp. It matches my ring and necklace. Saw the same earrings in a jewelry store for 3x more.